Snow could not keep some die-hard golfers off the course Sunday. 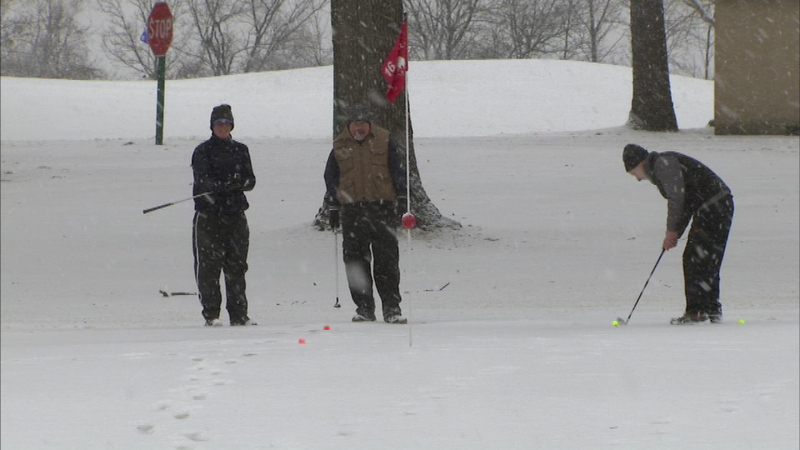 LEMONT, Ill. (WLS) -- Snow could not keep some die-hard golfers off the course when they hit the links for the 52nd annual Eskimo Open Sunday morning at Cog Hill Golf Club in Lemont. Golfers used colored golf balls so they could find them in the snow and there were no golf carts as golfers trudged through the snow carrying their golf bags. Die-hard golfers say it's all part of the fun. "We like to play in the Eskimo Open every year. We try to do it if the weather's decent enough," said Dave Pendil. "It's kind of questionable (Sunday), but you know what, we really enjoy doing it, it's a lot of fun." Only 83 of the 150 golfers who signed up came out to play. During last year's polar vortex only 35 braved the frigid conditions.